The summer of 1273 is peaceful for most of England, but Prioress Eleanor of Tyndal Priory is troubled. Her friend, Crowner Ralf, is newly widowed with a baby daughter. Her new anchoress is terrifying her servants and welcoming visitors to her window at night. And then Martin the Cooper is poisoned at the local inn. Is the murderer his usual whore, about to be tossed aside for another woman? Or is it the innkeeper's niece who has secret reasons for fearing him? Perhaps the blacksmith did it, a man whose temper might have exploded when he was mocked once too often? Martin certainly had a wealth of enemies. The killer could be any of them. Eleanor offers what help she can to the investigation, as does Sister Anne, a former apothecary. Yet her own problems multiply and Eleanor has good reason to regret her kindness: one of the nocturnal visitors to the anchoress' window has been Brother Thomas, a man the prioress secretly loves. Now his loyalty to her as head of Tyndal Priory is suspect. Bodies multiply. Suspects disappear. No one likes the direction the evidence points, but God's justice must be rendered—even for the most forsaken soul. "More horrific murders by poison follow before Eleanor and Ralf discover the truth in the stunning conclusion. 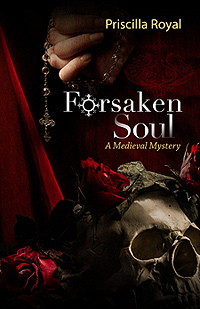 Against an authentic backdrop of medieval life and lore, Royal once again brings alive characters who are true to their period yet exhibit emotions and feelings that 21st-century readers will recognize as their own."